Deciding to hire at-home help to assist your elderly parent or loved one is difficult and requires the input of all those involved, including family members and other members of your parent’s support system. Once you have established the need for home care services, next come the challenges of hiring suitable caretakers, maintaining relationships with them, and setting expectations for care. However, the responsibility of caring for an elderly or ill parent does not end with hiring a home health aide or attendant. Prevent confusion and ensure a fair division of labor and responsibility between family and professional caretakers by following these simple tips. There are many in-home care services available, from round-the-clock medical care to part-time assistance with daily activities. Depending on the type of care your loved one requires, the kind of caretaker you hire and their specific role will also vary, as will the shared responsibilities that will fall on you and your family. Understanding the differences between the most common home care professionals and their roles will help in hiring the right one for your elderly parent. 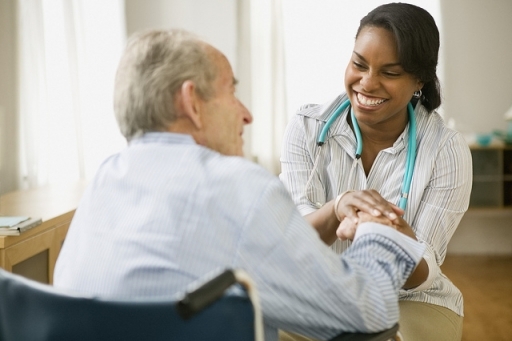 A home health aide (HHA) is the most common type of in-home caretaker. HHAs’ primary responsibilities are to provide personal care such as dressing, bathing, feeding, and grooming. HHAs can also help with light medical care such as changing dressings or reminding clients to take their medication. Certified nursing assistants (CNAs) function similarly to HHAs, with additional medical training that allows them monitor vital signs and discuss changes in health with medical professionals. For the elderly who do not have a medical need but still require some assistance in daily activities such as laundry, general housekeeping, and grooming, home attendants and personal care workers are available. Because HHAs and CNAs are often required on a round-the-clock basis, many agencies will recommend hiring two or three professionals who rotate shifts. Alternatively, if a family member is available to help care for their loved ones during specific hours, one caregiver may suffice. When interviewing and hiring HHAs and CNAs who will essentially live with your parent or loved one, be sure you discuss and clarify what you expect from him/her. This conversation should cover everything from daily tasks to emergency protocol. You know your parent better than anyone, so be sure to cover what is important to them. Are there any cultural issues, religious practices, or dietary needs to be aware of? Food & Meals: Will the aide be responsible for cooking meals or just feeding your parent? Will you provide your aide with food and meals or will they be responsible for themselves? Cleaning: Who will be responsible for cleaning your parent’s home or living space? What level of meticulousness in cleaning is expected from the attendant? Errands: Will the aide be asked to run errands for your parent, such as picking up prescriptions and groceries, or is this something you will do? Will the aide be responsible for laundering and folding clothing? Emergencies and Contact: What is the aide expected to do in the event of a non-medical emergency? Who will serve as his/her primary family contact? Will you or a sibling be contacting the aide daily for updates? Personal & Vacation Time: How much personal or free time will the aide be allotted daily, weekly, and monthly? The final issue to consider is that certain agencies may have rules for what caregivers are and are not allowed to do in the home. You or a loved one must fill in the gaps to take care of anything that caregivers cannot, either due to agency regulations or explicit instructions from you. In caring for a loved one, HHAs and CNAs are bound to form a bond with your parent, your siblings, and you. Ensure your caretakers’ and family’s well-being by setting and sticking to clear expectations to avoid surprises in responsibility. If you’re having problems, call Abcor and explore how their Chicago home health program can help!